Coverage of Syria's civil war has been polarised by competing narratives. Relying as we are on sources like activists and opposition politicians, a more moderate approach ought to have been adopted, but instead news channels like Al-Jazeera Arabic have adopted a decidedly opposition-friendly stance. By KHADIJA PATEL. The United Nations and Arab League special envoy to Syria, Kofi Annan was reported to be on his way to Qatar on Sunday night after a second round of talks with Syrian President Bashar Al-Assad in Damascus. Annan had hoped to secure Assad’s favour for a national political dialogue between the government and the opposition and also gain unfettered access for humanitarian aid agencies into the restive region of Homs. Assad is said to have rejected the proposal of any political dialogue as long as “terrorist” groups were trying to destabilise the country. Syrian opposition groups meanwhile dismissed the offer for dialogue so long as the Syrian military continues its offensive in the north of the country. Burhan Ghalioun, the head of the factitious Syrian National Council, labelled the calls for dialogue “naive”. As Annan haggled with Assad and opposition groups, reports indicated Syrian forces had not let up its relentless shelling of the opposition strongholds in Homs. In the north Syrian town of Idlib, fighters from the Free Syrian Army were reported to have been trying to hold back government troops in fierce clashes. Sixteen rebel fighters, seven soldiers and four civilians were killed in the Idlib fighting, according to the Syrian Observatory for Human Rights, which claimed 15 other people, including three soldiers, had been killed in violence elsewhere. International media coverage of Syria has depended on these reports. The images of death and destruction in Homs has proliferated on social media channels and formed the backbone of mainstream media coverage on Syria. The continued calls for an international intervention in Syria has been built on reports such as these. These reports from Syrian state media are ridiculed outside of the country, but within the country, it continues to thrive as the primary means of understanding the world for vast swathes of the Syrian population. Within Syria, the official state line still wields great clout. Addressing Syrians, the Syrian state media seeks to authenticate the legitimacy of Assad’s rule against international efforts to discredit him. Syrian TV has been especially busy exploring the alleged international plot hatched by the likes of Saudi Arabia and Qatar to enforce regime change in Syria. In addition to the daily street fight for control over Syria in the country’s most restive regions, there is a more insidious battle for ascendancy in the battle of the narrative of the Syrian uprising. As the civil war gathers more momentum on the streets, the daily fight for liberty and life is waged with equal ferocity in the narrative of the uprising. Assad’s media machine fights it out against a veritable army of opposition activists who feed international media outlets with snippets of life in a city under siege, grainy videos and daily reports of casualties. Given the lack of access to Syria to international news organisations, these activists have been crucial to providing an antithesis to the account spun by the state-controlled media. It has become accepted wisdom to distrust Assad’s version of events but it has also become standard practice to hail the opposition. International media has been too ready and too quick to adopt a “heroes vs. villains” approach to Syria. Coverage of Syria has been polarised by competing narratives. Relying as we are on sources like activists and opposition politicians, a more moderate approach ought to have been adopted, but instead news channels like Al-Jazeera Arabic have adopted a decidedly opposition-friendly stance. Al Jazeera Arabic’s Beirut correspondent, Ali Hashem, resigned on Tuesday after leaked emails revealed his frustrations over the news channel’s coverage of Syria. The network’s server had been hacked by the self-styled Syrian Electronic Army, revealing discontent among some of the network’s employees within the Arab news channel over its coverage of Syria. The major find in the hack was an email exchange between anchorwoman Rula Ibrahim and Hashem. In conversation with her colleague in Beirut, Ibrahim says she had “turned against the revolution” in Syria after realising the protests would “destroy the country and lead to a civil war”. She went on to deride the opposition Free Syrian Army as “a branch of al-Qaeda”. Shoruk Khaddour, a 23-year-old Syrian student, studying journalism at Brunel University in West London, has travelled to Syria twice since the uprising against Al-Assad began a year ago. She believes the uprising that began in the vein of the “Arab Spring” protests that took the region by storm was hijacked by a fringe opposition group who the international media has failed to adequately scrutinise. “The media omits and lies about the numbers and who exactly has been killed by whom,” she told Daily Maverick. Jillian C. York, Director of International Freedom of Expression at the Electronic Frontier Foundation, writing in her personal blog, is careful to stress that criticism of coverage of Syria does not necessarily denote support for Assad. “I have known and talked about the horrors of the regime since long before March 2011. But while even 1,000 civilian deaths are far too many, these numbers matter when they’re being used to justify intervention,” she says. “The media’s almost total reliance upon activists – not simply citizens, but self-described activists – is therefore problematic. And yet, criticizing that fact has become even more problematic. York bemoans the lack of a more objective slant in international reportage on Syria. “At the moment, you have what is essentially a divide between journalists, commentators, and media bureaus that are very clearly pushing the opposition line and those that appear to be shilling for the regime. And there’s no middle ground – there’s almost no one condemning the regime, for example, whilst simultaneously questioning the dominant opposition narrative. Those who dare search for truth are immediately labelled as being on one side or the other,” she says. Blame, Responsibility, and How We Talk About Syria in The Atlantic. Al Jazeera reporter resigns over “biased” Syria coverage in Al-Akhbar. 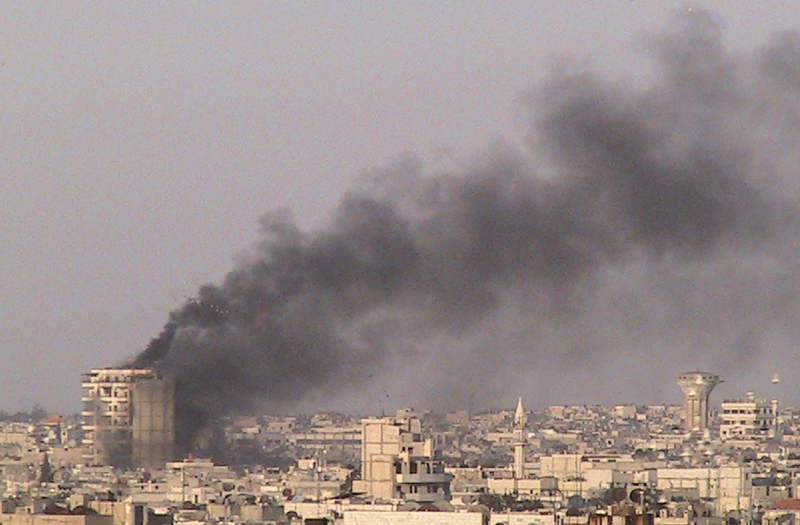 Photo: Smoke rises from the Jab Al-Jandli district of Homs. REUTERS.